For anyone who has spent any time leaning and perfecting freestyle, you realize that the more you practice it, the more your understand it is a technique sport. There are so many movements that have to be executed correctly for it to work well, that it can overwhelm you. So pick one or two drills or areas of focus per training session and just focus on that. It WILL pay off for you in the long run! Here’s an excerpt from Swimming Anatomy with permission of the publisher, Human Kinetics. “As the hand enters into the water, the wrist and elbow follow and the arm is extended to the starting position of the propulsive phase. Upward rotation of the shoulder blade allows the swimmer to reach an elongated position in the water. From this elongated position, the first part of the propulsive phase begins with the catch. The initial movements are first generated by the clavicular portion of the pectoralis major. The latissimus dorsi quickly joins in to assist the pectoralis major. These two muscles generate a majority of the force during the underwater pull, mostly during the second half of the pull. The wrist flexors act to hold the wrist in a position of slight flexion for the entire duration of the propulsive phase. At the elbow, the elbow flexors (biceps brachii and brachialis) begin to contract at the start of the catch phase, gradually taking the elbow from full extension into approximately 30 degrees of flexion. During the final portion of the propulsive phase the triceps brachii acts to extend the elbow, which brings the hand backward and upward toward the surface of the water, thus ending the propulsive phase. The total amount of extension taking place depends on your specific stroke mechanics and the point at which you initiate your recovery. The deltoid and rotator cuff (supraspinatus, infraspinatus, teres minor, and subscapularis) are the primary muscles active during the recovery phase, functioning to bring the arm and hand out of the water near the hips and return them to an overhead position for reentry into the water. The arm movements during freestyle are reciprocal in nature, meaning that while one arm is engaged in propulsion, the other is in the recovery process. Several muscle groups function as stabilizers during both the propulsive phase and the recovery phase. One of the key groups is the shoulder blade stabilizers (pectoralis minor, rhomboid, levator scapula, middle and lower trapezius, and the serratus anterior), which as the name implies serve to anchor or stabilize the shoulder blade. Proper functioning of this muscle group is important because all the propulsive forces generated by the arm and hand rely on the scapula’s having a firm base of support. Additionally, the shoulder blade stabilizers work with the deltoid and rotator cuff to reposition the arm during the recovery phase. The core stabilizers (transversus abdominis, rectus abdominis, internal oblique, external oblique, and erector spinae) are also integral to efficient stroke mechanics because they serve as a link between the movements of the upper and lower extremities. This link is central to coordination of the body roll that takes place during freestyle swimming. I am getting back in the pool these days and see beginners making the same mistakes I made, thinking, “If I just increase my strength, then I’ll be so much better.” I’ve since read that swimming is 70% technique and 30% endurance/muscle. Much of the technique is learning how to move through the water-space with as little drag as possible. Drag slows you down. Drag makes you work harder for the same speed or distance. The take-away from this excerpt is to reduce your drag! 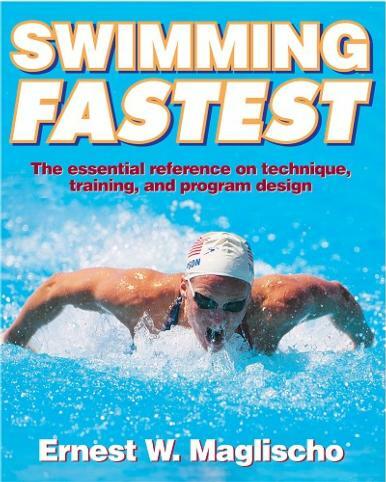 In this excerpt, we learn about reducing drag and increasing propulsion from the book “Swim Fastest“, reprinted with permission of Human Kinetics. while the arms and shoulders are moving up and down. To reduce form drag, keep the head in line with the trunk whenever possible. side to breathe in the front crawl stroke. Maintain horizontal alignment by swimming through the water, not over it. armstroke and kick, however, at least when it is possible to do so. the case of butterfly, to allow arm recovery without forward dragging. pushing the body downward will only increase form drag. All entry and recovery movements of the arms and legs should be “soft” and smooth to reduce pushing drag. The first portions of all underwater armstrokes, the downsweep and outsweep, are not propulsive. during the downsweeps and outsweeps of all four competitive strokes. Don’t kick any deeper, higher, or wider than necessary to produce an optimum amount of propulsive force. of the torso in both lateral and vertical directions. Don’t pull the legs into a flexed position in the flutter and dolphin kicks. legs forward during leg recovery in the breaststroke. Always wait until a high elbow catch position has been achieved before applying backward force against the water. armstrokes before swimmers begin to push backward against the water. to dictate the pitch of the hands. Always stroke in diagonally backward patterns during the propulsive phases of the underwater armstrokes. described in this chapter and in chapter 1. Propulsive efforts should cease as the hands approach the legs on their way to the surface. Anyone who has spent any time developing their freestyle knows that technique is everything. Yes, eventually you will have endurance but technique, reducing drag, and drills make for an excellent swim. One popular swim author claims to teach effortless swimming. Although it is a good book, I have yet to find that effortless swim. But with proper technique and its practice, you can have a faster time and expend less energy. The following except comes from Mastering Swimming, reprinted here by permission of Human Kenetics. 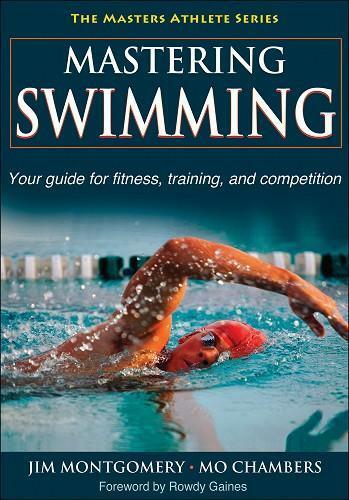 The power in swimming comes from the core group of muscles, which this book defines as the area from the neck to the knees, including all of the upper-back and shoulder muscles, the abdominal muscles, and the trunk and upper-leg muscles. The best way to access this power is with a great setup at the beginning of the freestyle underwater pull, or what is commonly called the catch. This term, which first became popular with the development of the crawl or freestyle stroke in the 19th century, refers to the point in the stroke when a swimmer’s hand connects with the water and starts to pull. The catch itself is not the main propulsive part of the stroke, but when properly executed, it sets your stroke up to be more effective through the propulsive power phase that follows. The freestyle catch occurs in the first 9 to 12 inches (23-30 cm) of the stroke, where you begin your pull by pressing the fingertips down while keeping your elbow up. Imagine yourself reaching over a waterfall and anchoring your palm and forearm on the rocks so that you can pull your body over. The late Doc Counsilman, former head coach of Indiana University and coach to 48 Olympians, including Jim Montgomery, was well known for his analogy of pulling over a barrel. Great freestyle swimmers anchor their hands in the water and use their core muscles to rotate their bodies past their hands. To properly achieve this catch position, internally, or medially, rotate your shoulder and open your armpit. Imagine driving your elbow toward the pool wall in front of you. Consider the effect of body rotation on the depth of your hand catch. The forward reach and downward press of your arm at the entry and catch causes your body to rotate to the side. Keep your hand planed directly back (toward the wall behind you), with your fingertips toward the bottom of the pool, until your arm has reached midstroke. This is a key point for maintaining a powerful application of propulsive force. Finding the right amount of body rotation will automatically help you find the ideal depth in the pull. Once you set the high-elbow position in the underwater pull, maintain it throughout the stroke cycle. By keeping your hand and elbow anchored in the water at the catch spot, you will be able to recruit core muscles to rotate your body past that spot on the longitudinal axis. At midstroke, the bend of the elbow is approximately 90 degrees and then opens up again as your hand finishes the stroke. Your hand moves slowest at the catch phase of the stroke, but gradually picks up momentum until it is moving fast under your hips at the end of the stroke. Keep your wrist flexed to hold your hand perpendicular to the water’s surface at the finish of the pull. The acceleration of the hand through the underwater pull synchronized with the rotation of the body’s core creates the power phase of the freestyle stroke. With a well-executed hand entry and extension followed by an effective catch and follow-through, your hand will actually come out of the water in front of the point where it entered! The hands of world-class swimmers exit the water several feet (about 1 m) in front of their entry points. These swimmers have an incredible amount of shoulder and back flexibility, allowing them to position their hands, forearms, and elbows in the catch position much earlier in the stroke. This creates a longer and more propulsive power phase. 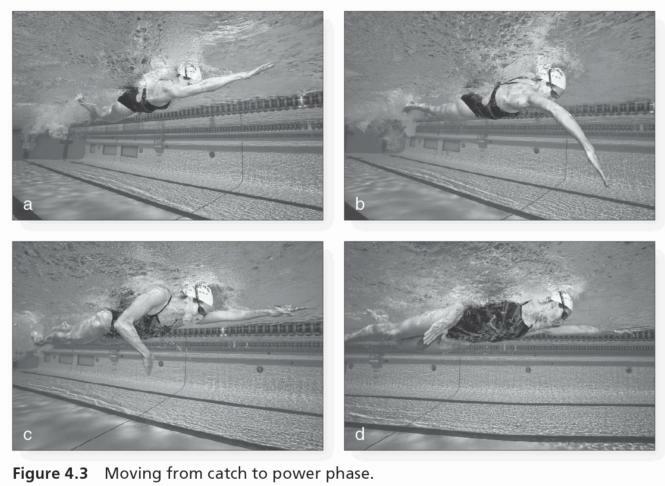 The following series of photos depicts the freestyle stroke from catch to power phase (figure 4.3, a-d). Many adult novice and intermediate swimmers lack the body rotation, strength, and flexibility to hold their shoulders and elbows above their pulling hands throughout the freestyle pull. A well-designed dry-land program that includes stretching and strengthening helps swimmers learn and perfect the underwater stroke. Use the following teaching progression of both on-deck and in-water skills to learn the mechanics of the catch position and the correct muscle recruitment for transitioning into an efficient underwater pull. Begin by standing on the pool deck in a streamlined position. Have a partner hold a hand against yours, applying slight pressure against your palm as you proceed to simulate the freestyle pull pattern. Start by pressing your fingers and elevating your elbow. Feel the different use of muscles during a high-elbow, a straight-arm, and a dropped-elbow pull. When you do a high-elbow pull, you should feel your core muscles come into play, including the upper-back, chest, and shoulder muscles. Use stretch cords to manipulate your hand and forearm into the desired movement of the stroke cycle. Start with your arms fully extended at shoulder-width and your wrists slightly flexed. Pop up your elbows and move your arms back in a curved path, first diagonally outward and then inward. Once your hands have moved across and under your body, extend your elbows and straighten your arms. Notice that your hands travel farther than the elbow. Another great teaching tool is the in-water press-up. Position yourself at the deep end of the pool, facing the wall. Place your palms flat on the deck or gutter of the pool. Start with your head and body submerged, and then press up, using the buoyancy of the water to lift your body out. Maintain a high-elbow position and lift your body as high as you can. Sensitizing your hands and forearms can dramatically enhance your feel for the water. This allows you to make subtle adjustments in the pitch of your hand so you can hold the water more effectively, whether anchoring in the catch position or finishing the propulsive power phase. You will learn to recognize water pressure against your hand and forearm during every phase of the stroke. Here are three simple ways to sensitize your hands: press the fingertips of one hand hard against the fingertips of the other, press your fingertips against the pool deck while resting, or rub your hands together or on the pool deck. Swimming with hand paddles generates more water pressure against the palms of your hands, which activates the muscle groups that propel your elbows up. Novice masters swimmers should use smaller paddles, preferably with holes in them. Try eliminating the wrist strap of the paddle and use a single strap or tubing around your middle finger. Focus on keeping water pressure on the paddle. If you drop your elbow, the paddle tends to slide off your hand. Here’s what a lot of you are looking for, a basis from which you can build your own triathlon training plan. You probably have questions like; How long do I base train?, At what point do I start to taper before a race?, When should I add speed work? You’ll find many answers in Triathlon 101-2nd Edition, reprinted here by permission of Human Kenetics. “Setting up your triathlon training calendar and log can be the two most important actions you take, perhaps more important than any swim intervals, long rides, or morning runs you do. Your training calendar can be a preprinted calendar, a poster board, an appointment book, or a calendar software program that prints out customized monthly grids. Just make sure that you have enough room to write down your daily workouts. Your training calendar should also be on paper, as opposed to just on a computer screen. Although a software program is great for creating customized calendars, make sure it can print out monthly grids. You want your training calendar to be within plain sight, not hidden away somewhere on a computer hard drive. Dedicate a space for your calendar—someplace that you know you’ll see every day. Once you’ve chosen your calendar and picked a place to put it, it’s time to make the commitment and put pen to calendar (scary, huh?). First, write your race goal on your training calendar. How much time does that give you to train properly? Again, take into account your current fitness level and skills. If you need to reassess your race goal and set your target on something more realistic, now is the time to do it. Although part II covers training in much more detail, you’ll need to know a little bit about what experts consider to be the optimal way to train. Training in phases or cycles has long been considered the best way to condition the body to the rigors of endurance exercise. Each phase has a specific objective, and the workouts fulfill that objective. Coaches and fitness experts don’t always agree on the exact number of phases and objectives (largely because training differs among sports and elite athletes require more complex training plans). However, if you are a multisport novice or future triathlete looking for your first finish-line crossing, you should integrate some basic phases into your training calendar. Following is a brief description of each of these phases. If you think you have a good handle on how much time you need to devote to each phase after reading this section, plan your training calendar accordingly. If you’re super organized, you might even want to use color highlighters to block off phases, using a different color for each one. Don’t worry about writing down specific workouts; that comes later. For now, just get familiar with the phases, objectives, and estimated time frames. Objective: Learn a new activity never or rarely performed before. Estimated time: Depends on level of inexperience. If you are learning to swim the front crawl, this phase can take three months or more. Objective: Create a foundation of training with gradual, safe adaptation to a physical activity. Estimated time: Three to six months, depending on current conditioning, skills, and the distance for which you are training. Objective: Increase both the pace you can maintain and the efficiency of your exercise. Estimated time: Three weeks to several months, depending on current conditioning and performance goals. Objective: Boost race day confidence by completing workouts similar to what you will be doing in the event. Estimated time: One to two months, depending on current conditioning and race goals. Objective: Feel mentally and physically fresh for a race. Estimated time: One to four weeks before your event, depending on the distance. Sprint-distance races usually only require a week of tapering. When you think of a journal or log, the first thought that might occur is sentimentality about the past. Part of the value of keeping such records is to remind you of your accomplishments, but keeping a record of your triathlon training and racing has more practical applications as well. Training logs can help you avoid injuries and improve your performance. Maintaining an accurate log of your daily and weekly workouts is one of the best ways to keep on track. A log that chronicles the variables that affect your energy level and performance can help you achieve your triathlon goal. You can purchase preprinted training logs. Some have motivating quotes and pictures and space for many variables. If you’re a computer geek, several workout log programs are available. • Hours slept. Current research suggests moderate sleep deprivation has little effect on performance during the adrenaline high of competition. Still, that ragged feeling during a three mile training jog might be the result of too little snooze time. • Waking pulse. Record your beats per minute when you awake, preferably while you’re still in bed. An increase of more than three or four beats can signal overtraining. • Distances and times. Tracking correct distances and workout times can keep you honest. It is also your most reliable measuring stick to check your progress. • Time of day. Studies show that our energy levels fluctuate during the day. As long as all other variables remain the same, you can pinpoint your peak time of day for a workout. • Intensity. Use descriptive terms or a scale of 1 to 10 (1 is very easy and 10 is extremely difficult). Monitoring intensity levels is a key in avoiding too many back-to-back killer workouts (or in avoiding that crippling disease couchus potatoeus). • Feelings. Though many things can affect your mood, a change in mood is sometimes a precursor to sickness and an indication of overtraining. For example, irritability can be an early sign that you’re pushing yourself too hard. • Injury flags. Pay close attention to any unusual pain, especially around the joints where most injuries occur. Note any such aches and pains in your log. • Weight. Get on the scale in the morning, after you’ve relieved yourself. A 3 percent or more loss of body weight might mean you’ve lost too much fluid. Take an easy day or, better yet, a day off. • Weather. If you are easily affected by heat, cold, humidity, or other weather variables, keep track of these conditions. It’s not often I can do this but the following is an excerpt from an upcoming book (currently only available as a pre-order), Triathlon 101 (Human Kinetics, due out March, 2009). In this updated edition reprinted with permission from Human Kinetics, Triathlon 101, you’ll learn the five training phases for triathlon success. This phase creates a foundation of training with gradual, safe adaptation to a physical activity and consists mainly of long workouts done at a slow pace. According to Mora, the focus of this phase should be on gradual increases of the length of workouts of no more than 10 percent per week, a rule that is especially crucial for running and helps in avoiding common overtraining injuries. This phase can last from three to six months, depending on current conditioning, skills, and the distance being trained for. This phase increases the pace you can maintain and the efficiency of your exercise. According to Mora, the speed and technique phase is for those who have already run a few races and would like to hone their skills. However, for those running a triathlon for the first time, Mora recommends dismissing any expectations of finishing in a certain time and instead focusing on simply finishing the race. When you are drilling, and you should add some drills to most every swim workout, swim-golf is a great way to track your progress. Essentially what you do is combine your stroke count per 25 or 50 y/m with the time it took to complete. It is a proxy measurement for technique efficiency and you should try to bring that number down over time. Here’s a great excerpt from excerpt from Swimming Fastest by Ernest Maglischo reprinted with permission. “One of the most common drills for increasing stroke lengths is to count strokes for one pool length and repeat the drill while attempting to cover the distance with fewer strokes. All of this is done at a slow speed. This is a good drill for young and inexperienced age-group swimmers. The efficiency of their strokes and their performances will improve when they attempt to cover each pool length with fewer strokes, regardless of the speed of their swims. Although a drill like the one just described is excellent for inexperienced swimmers, it has limited value once athletes can swim with good coordination and reasonable efficiency. At that point, swimming speeds and stroke rates must be included in drills designed to increase stroke length. Because the relationship between the combination of stroke rate and stroke length that will produce the most efficient swimming velocity will be different for each race distance and for each swimmer, all three elements should be included in drills to improve stroke lengths. Following are some drills that include all three elements. This drill is so named because it involves swimming and is scored like golf. The value of the drill is that it allows each swimmer to discover the best way to improve the relationship between stroke length and stroke rate to achieve a particular swimming velocity, whether through increasing stroke length, increasing stroke rate, or using some combination of the two. The drill is performed in the following manner. The athletes swim a particular repeat distance, 25 or 50 yd or m, while counting their strokes. Their times are noted, and the two measures, number of strokes and their time for the swim, are combined for a score. For example, a time of 30.00 for 50 m with a stroke count of 40 would produce a score of 70. Once they have established a base score, swimmers can use any one of several variations of the game to improve the relationship between their stroke rates and stroke lengths. The goal is to reduce the score by (1) swimming faster with fewer strokes, (2) swimming faster with little or no increase in the number of strokes taken, or (3) swimming the same time or nearly so with fewer strokes. If the swimmer in the previous example were to swim 29.00 with the same stroke count, the score would be an improved 69. This swimmer’s stroke rate has undoubtedly increased with little or no loss of stroke length, which accounts for the improved time. Similarly, the same time of 30.00 coupled with a reduced stroke count of 38 would produce an improved score of 68. In that case, the swimmer’s stroke length will have improved and the stroke rate will have decreased with no detrimental effect on swimming speed. The results will be more difficult to evaluate when lower scores result from faster times that are coupled with a greater number of strokes. This is generally a desirable effect because the lower score results from time reductions that are proportionally greater than the amount by which stroke lengths have declined. This effect can certainly be considered beneficial for improving sprint speed. Increases of stroke rates and the reduction of stroke lengths may not be advantageous for longer sprints, middle distance races, and distance events if the perceived effort that produced lower scores is beyond that which swimmers feel they could sustain over their race distance. The kick-in drill works best for increasing stroke length. To perform it, athletes swim a series of 50 or 100 repeats while counting the number of stroke cycles required to complete each repeat. Before starting, each swimmer should be assigned the maximum number of cycles they are permitted to use for the repeat distance in the allotted time. That number should be one or two cycles fewer than they generally need to complete that distance. The goal, then, is to complete the repeats with fewer strokes. If they do not finish the repeat when they have completed their assigned number of stroke cycles, they must kick the remaining distance to the finish. The send-off time for the repeats should be set so it is challenging but manageable if the swimmers can complete the repeats without kicking in. The time goal will motivate swimmers to try to reduce their strokes without sacrificing swimming speed. This drill puts a premium on increasing stroke length and doing so without increasing the energy cost of the swim. This drill can help sprinters increase their stroke lengths while swimming at race speed. The drill can be done in a number of ways. With one method, swimmers sprint 25 yd or m at maximum speed while trying to reduce their stroke count. This method puts a premium on swimming fast with a longer stroke length. Another method is to try to swim each repeat faster without increasing the stroke count. This encourages them to increase their stroke rates without shortening their stroke lengths. The distance that swimmers cover with a push-off can become a confounding variable with both drills. Therefore, swimmers should try to keep that distance similar from swim to swim. The influence of the push-off for different distances can be eliminated from this drill by counting only the number of strokes required to get from one set of flags to the next. Dave Scott, who is a six time IronMan World Champion, and active.com show some of his favorite stretches in this video. They include stretches for your glutes, hip flexor, piriformis, hamstring, quad and shoulder girdle. Enjoy and remember to check out the resources page with other great videos. Our online store offer terrific videos as well. In the last 3 years in particular, I have been working on my core strength and stretching. It helped my back problems, rehab after back surgery, swimming and stability. The core is the connector between your upper and lower body and should be thought of as a vital link for triathlon. When you run, you swing your arms to counter to your leg movement. In the middle is the core. If you get out of your saddle while cycling, your hands grasp the handlebars while feet are in the pedals. The middle link is the core. The link between your stroke and your kick while swimming is your core. As I increased my core strength, I noticed simple functional things in daily life also got easier like bending over, getting up and good posture. These make so much more of a difference now than when I was 18 years old. Hopefully, you can see that core strength can be important to daily life as well as triathlon. “The Core Performance” has many exercises I do and it has training regimens for several different levels of athletes. I view the “Complete Book of Core Training” as successfully trying to be just that. It has many many pages of different core exercises with different variations to try. Don’t forget to check out the short videos on Resources/Core page as well.